Palani Hill, on top of which lies the Palani Murugan Temple. P Dhanapal was once the head of the Hindu Religious and Charitable Endowments (HR&CE) department of the Tamil Nadu government. In his position as the head of the department, he would have been the man answerable for the proper upkeep and maintenance of hundreds of temples and related artefacts across the state. And today, the police is going after him for conspiring to steal gold and other precious metals for making a new idol at the centuries-old Palani Dandayuthapaniswamy Temple. The case against the former chief of HR&CE is that he was instrumental in the conspiracy to embezzle over Rs 60 lakh in 2003 towards the purchase of gold for making a new idol at the temple. Apart from temple funds, huge quantities of gold appear to have been collected from the devotees. Once the idol had been completed, it was found within months to have turned black, and instead of nine rare metals, only four had been used in the making of the idol. Despite suspicions, the officers in charge did not file complaints. The crime was discovered recently when the Tamil Nadu police idol theft wing chief Pon Manickavel received a tip-off. The temple’s then executive officer and Muthiah Sthapati, the idol maker involved with the alleged crime, are among the five arrested so far. Reports say the prime suspect, Dhanapal, may have attempted to flee the country along with his family, and that such an attempt had been scuttled. Dear Reader, Swarajya is gearing up for general election 2019, just like you are. In the run-up to the elections, we intend to bring you stories from places the old media will certainly stay away from. 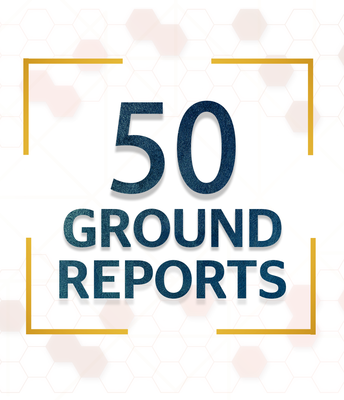 For the 50 Ground Reports Project, we will send our reporters to far corners of the country to bring you the truth and nothing but. But for that, your support is absolutely essential. With your contribution, we can pursue reporting across the country unabashedly. Help us bring real voices from the ground – this is the most meaningful way that you can support a fledgling outfit like Swarajya and keep encouraging us. Help us bring 50 impactful stories from the ground, this election season. Support us in the form of readership & sponsorship.